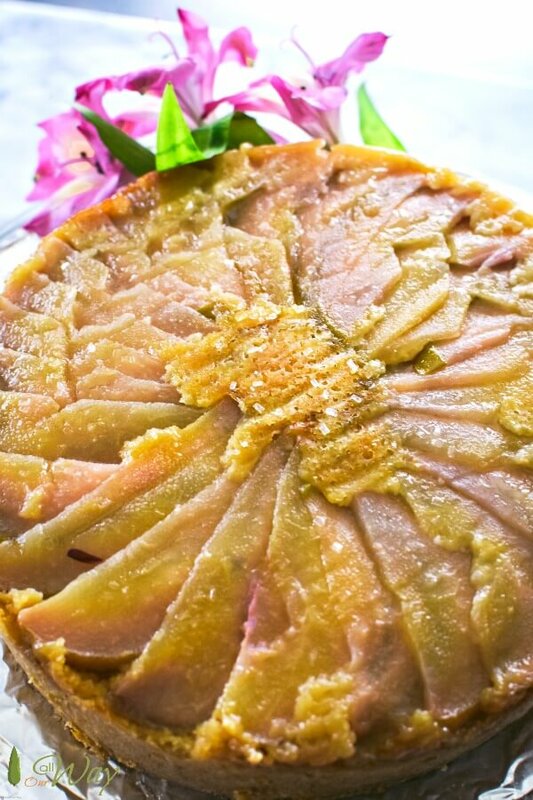 We are starting spring on a sweet note with Slow Cooker Polenta Cake With Caramelized Pears. This simple cake has a golden color from the cornmeal and a texture that is both rustic and delicate at the same time. The sliced pears on the bottom of the pan caramelize as the cake bakes in the slow cooker. Each delicious bite is full of a bright lemon flavor made just sweet enough. The Polenta-pear cake is very satisfying with your morning cup of coffee, tea or as an incredibly tasty snack. 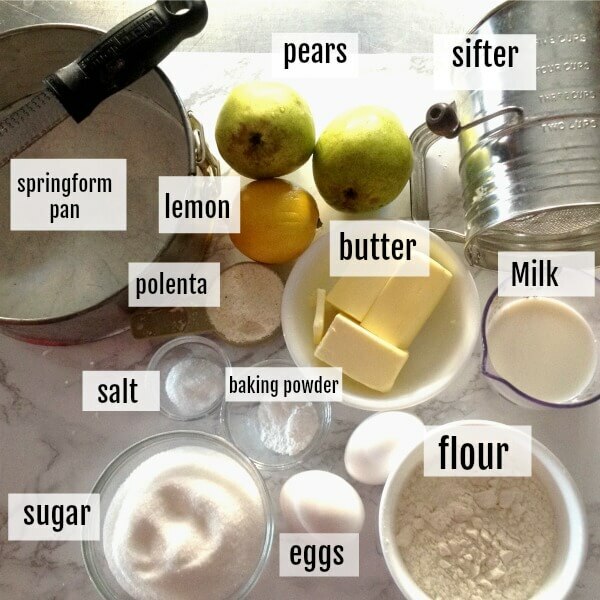 For this recipe you will need: sugar, pears, flour, yellow cornmeal, baking powder, salt, unsalted butter, eggs, lemon zest, milk. white sparkling sugar (optional). 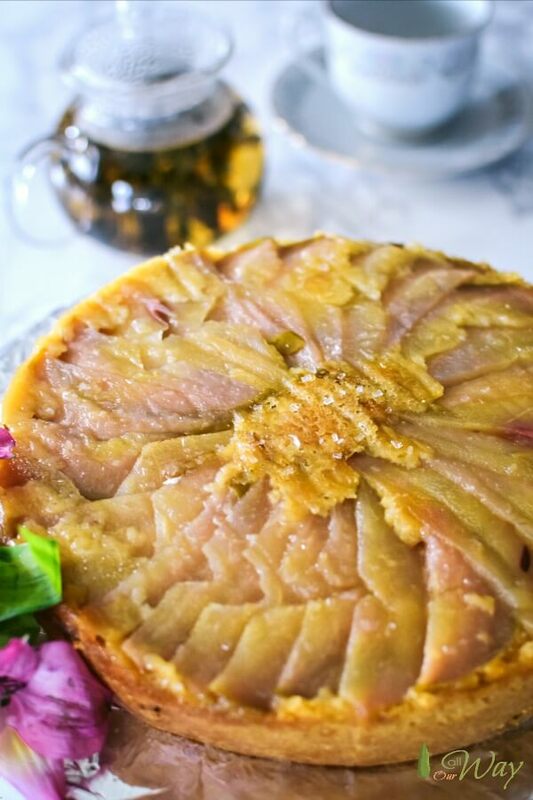 A rustic Italian Polenta Cake with caramelized sliced pears on top. When you think of polenta, you certainly don’t think of cake. But that changed when Carlo Zamberletti, a baker in Varese, a town near the Italian-Swiss border, decided he wanted to create a dessert that would represent his city. He knew it would be quite a challenge, but he was determined! Carlo started with local flavors and ingredients that was in the Lombardy region. He wanted to create a simple but very tasty dessert, one capable of pleasing every palate. And so, at the end of the 1930’s, the “Torta di Varese” was born. It wasn’t long before every bakery in Varese joined the bandwagon to make the delicious polenta cake. A traditional Italian rustic cake known as Amor Polenta or Torta di Varese. To this day, the local bakeries still make this famous polenta dessert. Although others have tried to duplicate the recipe, only Pasticceria Zamberletti makes the original recipe. Although in this area the dessert is called Dolce Varese, in other parts of the country it is Amor Polenta. Not many cakes can claim to put passion at the tip of your tongue, but this name holds the promise of a cake love story. Believe me, the love story blossoms at first taste and grows with each mouthful. It was this amor polenta that inspired us to make our slow cooker polenta cake. Corn flour is what gives this cake its beautiful golden color. But it’s not the ordinary coarse cornmeal or polenta you find in the grocery store. What you need is a finer ground version called “farina di mais fioreto” or the super refined “farina di mais fumetto“. If you can’t find the fine ground polenta or cornmeal, simply put it in a food processor and pulse several times. That should make it fine enough. The other flour you need is an all-purpose flour. We always use the unbleached type. Our version of the amor polenta cake is very simple and straightforward with a fresh lemon flavor coming from the lemon zest. The traditional amor polenta has ground almonds and vanilla or a liqueur flavored cake. We made the cake in a springform pan although you could use a round cake pan. The springform pan, we think, is easier because the side just falls away and you can upend the polenta cake onto a plate or cake stand. 1. Wash, core, then slice pears. 2. Overlap pear slices in spiral fashion on the bottom of pan. 3. Spread the batter evenly over the pear slices. 4. Set the slow cooker on high for 3 hours. Baking in a slow cooker or crock pot is a new experience for us. It took 3 hours to bake. It appears that there’s a slow cooker cake for every taste. Where have I been? So many cakes that you don’t have to watch like a hawk!! Serve the pear cake at breakfast, snack, or dessert with coffee, espresso, or tea. The low setting on a slow cooker is generally 190 ℉. The high setting usually sits at 300 ℉. How do I know what temperature to set my oven? Oven Times 15-30 minutes Slow Cooker Times and Settings 1 1/2 – 2 1/2 hour on High or 4-8 hours on Low. Oven Times 35-45 minutes Slow Cooker Times and Settings 3-4 hours o High or 6-10 hours on Low. Oven Times 50 minutes – 3 hours Slow Cooker Times and Settings 4-6 hours on High or 8-18 hours on Low. For this Pear Polenta Cake, set the oven temperature for 325 ℉ , position the oven rack in the center, and bake for 25 to 3o minutes. I love experimenting and I’ll be taking some of my favorite oven recipes and seeing how well they do in a slow cooker. The idea is really appealing with summer and and a packed schedule. What recipe would you like to convert to a slow cooker? I know you’re going to simply love this recipe. Especially if you enjoy desserts that aren’t extremely sweet! I would have loved to make this for my mamma and papà — they loved desserts with fruit. I understand why this dessert has the name “amor polenta”. These desserts are fantastic. Real family and crowd pleasers. If you have any questions please contact us and we’ll get back with you ASAP. This leakproof springform pan is ideal for making all sorts of delicious cakes and cheesecakes. We have several in different sizes. The one we used for this cake is an 8-inch pan. The lip on the bottom prevents leaking. If you plan on using several sizes, get the 3 pack. It’s very economical. When you make this cake I know your heart will beat with excitement. You’ll immediately want to slice it and pair it with a cup of coffee or espresso. And then, if it’s not special enough by itself, you may even want to top it with a bit of whipped cream or ice cream. Believe me, once your family or guests finish their slice, don’t be surprised when they come back demanding seconds. My love for rustic cakes just keeps growing. See if you and your family don’t feel the same way. This simple rustic cake is one that you'll want to eat throughout the year. It is simple to make and the fruit on the bottom of the cake caramelizes as it bakes. The pear slices form a gorgeous star pattern on top of the cake. Butter and flour a 8-inch round springform pan or cake pan. Cut a circle of parchment paper and place it on the bottom. Butter the paper. Sprinkle the 2 Tablespoons of sugar evenly over the bottom of the pan. 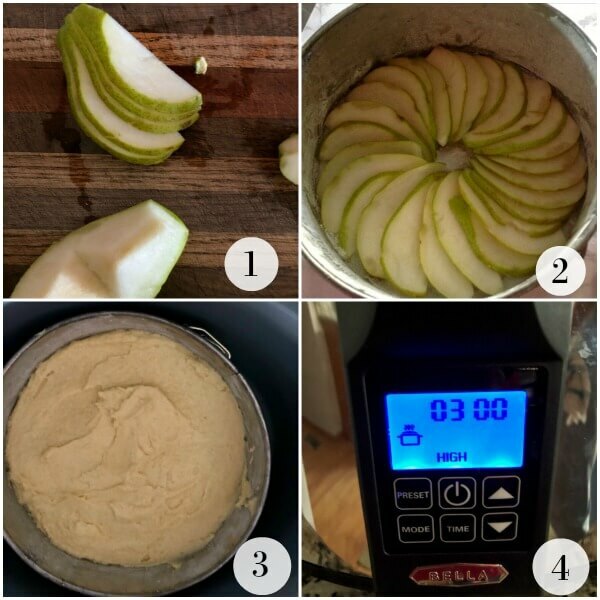 Arrange the pear slices on the bottom of the pan in a pinwheel fashion, overlapping them slightly. Sift together the flour, cornmeal, baking powder, and salt. In a large bowl with an electric mixer, beat the butter until light and fluffy. Gradually beat in the remaining 3/4 cup sugar, scraping the sides of the bowl. Beat in the eggs, one at a time, and the lemon zest until blended. On low speed, beat in half of the dry ingredients. Add the milk. Stir in the remaining dry ingredients just until smooth. Scrape the batter into the prepared pan, spreading it evenly over the pears. Place the pan in the slow cooker. Cover and cook on high for 3 hours, or until a toothpick inserted in the center comes out clean. Cool on a rack for 10 minutes. Invert the cake onto another rack and let it cool completely. Gently peal off the parchment paper. Serve plain or with sweetened whipped cream or ice cream. Position oven rack in the center. Preheat oven to 325 ℉. Follow instructions as for the slow cooker. Bake for 25- 30 minutes or when cake tester (toothpick 😉) inserted in center comes out clean. Follow the rest of the instructions for slow cooker. 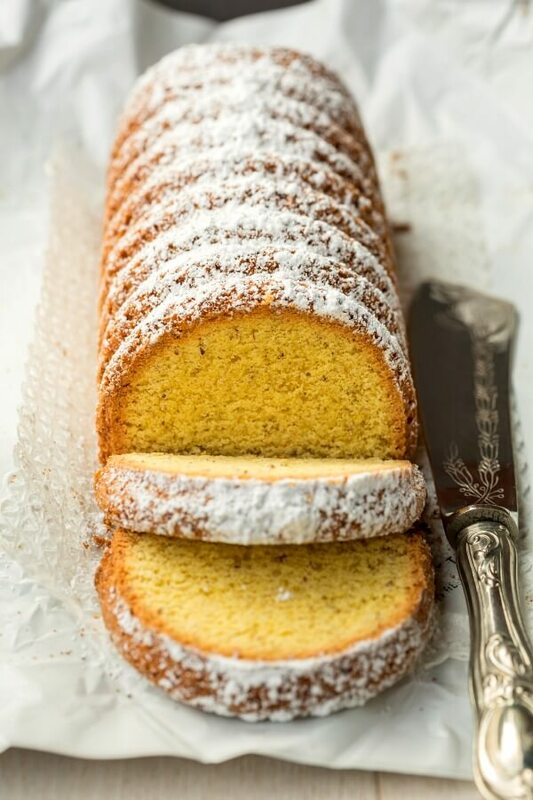 Using polenta in cake….genius! Seriously. I never would have thought to do it. The pear slices on top make it so attractive and I love the pairing of pears with the polenta. Pinning so I won’t lose this gem. Thank you. This is SUCH a treat. I love pears but I just don’t bake with them enough. Whenever they’re around the house, I end up eating them as they are. But this is such an easy recipe and such a fab way to use pears! So warm, gooey, and luscious. Never had thought of making a cake in a slow cooker, what a fab idea. 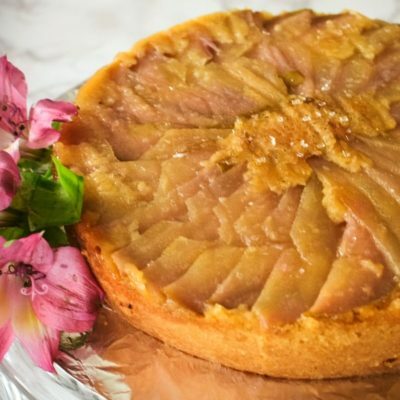 Polenta cake looks moist and with juicy pears taste so fabulous. Perfect for a coffee morning! I feel like I’ve been missing out! I’ve never even thought to make dessert in a slow cooker. A whole new world has opened up! I love my slow cooker but I’ve never baked a cake in it. Glad you reported doing so with such success. I’ll have to give it a try! p.s. 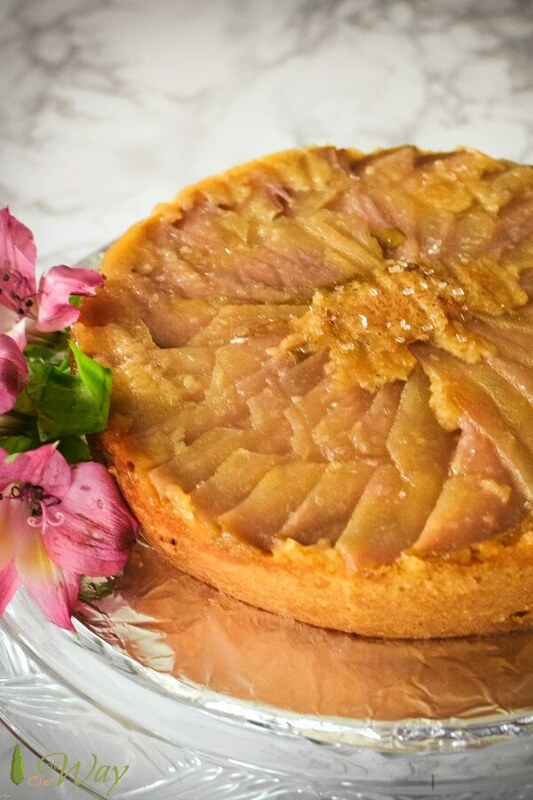 love the caramelized pears baked into this cake! What a fantastic idea on how to cook polenta! I love to it eat it when I go to my favorite brazilian restaurant but now I have to make it into a cake. Delicious recipe! This recipe makes me feel starting spring on a high note which I don’t mind at all because I love polenta. And making this is a slow cooker sounds even better. I’ve never tried a polenta cake before, but I absolutely love the flavors in this. The sweetness of the polenta paired with the pears sounds wonderful and the lemon really brightens it all up. It’s even better that you can make this in your slow cooker- brilliant! I love using my slow cooker because it is so handy. I have never made anything like this though. It looks delicious. I haven’t had the best of luck with slow cooker cakes. They always come out too wet and soggy, but I’ve never tried to bake them in a separate pan inside of the slow cooker. This cake looks divine., and the timing is perfect since my oven is broken. I can’t wait to give it a try. Hi, Patti! We didn’t have a problem at all. I love the fact that you can make it in a container. My daughter made two cakes and it worked for her. Let me know how it goes. Oh, the minute the cake was done I took it out so it didn’t steam in there. Love this idea! I’ve never made polenta in the slow cooker. Brilliant! I also appreciated the detailed instructions. 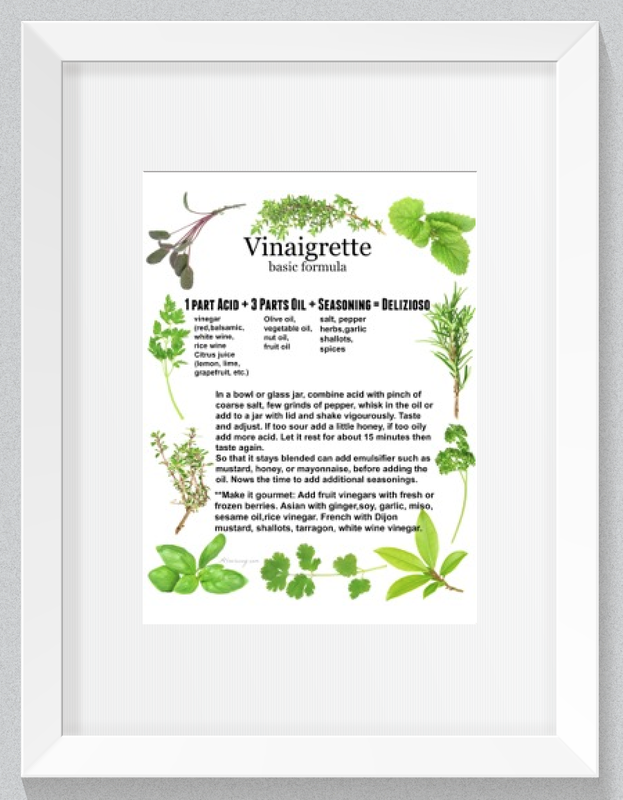 It makes the recipe so easy to follow and answers any questions before I even have them. Thanks! You’re welcome, Rachel! Hope you have a wonderful weekend. We love polenta but I’ve never made a polenta cake! And definitely never in a crockpot. I’m glad that you indicated that there was a difference in the corn flour used. I’ll definitely be picking some up. I’m a pear lover and think pears and the cake are a match made in culinary heaven! Thank you for the in-depth explanation – you have literally made this cake foolproof and it’s so stunning for the holiday! I’m sure using the slow cooker keeps the cake extra moist! Looks really yummy! I love the way this turned out. So pretty with the pear slices. I bet it tastes amazing. Who knew you could make a delicious cake in a slow cooker? This polenta cake sounds delicious and perfect to transition to spring. We still have some local pears available in Eastern WA, so it also gives me the perfect excuse to make good use of them. Thank you for the great recipe! Love the Slow cooker option to making this delicious,moist and yummy dish. I’ve never heard of polenta cake! I guess it makes sense, because cornbread-style cakes can be so delicious. I love the sweetened touch with the pears. This needs to be on my table soon!! I love my slow cooker, but have not make a cake in it. I think I need to give this a try. What a great dessert for entertaining with. Fuss-free baking is the best. This looks so good! We just bought a bag of pears the other day and now I’ve found the perfect recipe to use some of it on. Can’t wait. I’ve never dome a dessert in the crockpot. Does water from the cover drip onto the cake? Or is that no problem? My slow cooker has a small hole on top which is a vent. We had no problem with moisture dripping on the cake. I have never made a cake in the slow cooker but it sounds like baking I can handle! I love the caramelized pears too….this will be a good one for Easter! Well I happen to LOVE polenta cake. I have NOT made it in the slow cooker. This looks like a great experiment for the weekend. I need to make a dessert to take to an Easter gathering. I think the guests would LOVE this. This cake looks terrific. What a great idea.